Bubba's Garage: Going once, twice, SOLD! 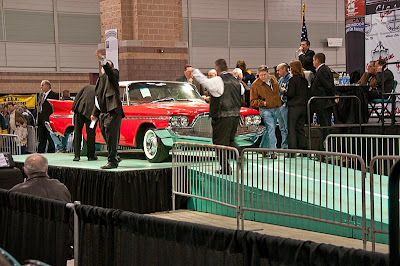 We decided to go check out the Atlantic City Car Show and Auction on Saturday. That was a waste of time. The vendors were all of the flea market variety. The car corral had about 25% modern cars and mostly crap. It was expensive at $20 box a person. The only bright spot was that the auction had a over dozen very cool cars. Oh well, at least we weren't sitting around the house. To try and salvage the outing I took Peg over to the outlet mall in Reading, PA. I like driving so the 500+ miles and 6 states put a smile on my face.